The Godwits of Gilroy - update. to local beach goers and dog walkers © Sheila Ryde. Wader Quest is a new charitable organisation that is born of our passion for waders and dedicated to providing assistance to Community Wader Conservation projects which are small and locally organised. It is our belief that these small projects are of vital importance in the conservation of waders as their cumulative effect can be a significant positive force in the fight against population decline and even extinction. The Dee Estuary Voluntary Wardens organisation which relies on local volunteers working in Wirral to raise awareness to provide some space for the birds to thrive is a very good example of this. 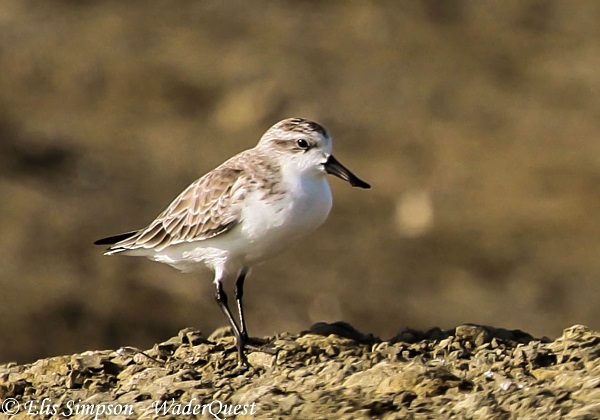 Spoon-billed Sandpiper; Wader Quest raised £3,526.06 for this Critically Endangered species. Wader Quest started as a fund-raising exercise to raise money for the Spoon-billed Sandpiper captive breeding programme at Slimbridge Wildfowl and Wetlands Trust and led to raising funds for another species, namely the Hooded Plover in Australia. Part of this fund-raising project involved travelling (self-funded) in search of waders across the world and as we did so we witnessed first-hand many of the problems waders are facing leaving us determined to do whatever we can to help them. We are an entirely voluntary organisation where no wages or expenses are paid to staff or volunteers and income from sponsorship and donations is ring-fenced to be used exclusively for wader conservation; the organisation’s running costs are derived from sales and our mobile charity shop. We are aware that not everyone will be in a position to have hands-on involvement in wader conservation however much they care about the plight of these birds. With this in mind we have a sponsorship scheme with categories from individual to corporate so that those who wish to can still ‘do their bit’ through our projects. Raising awareness is equally important and to this end we give talks to groups, clubs and societies about waders and their conservation, we attend bird fairs and write copiously about waders on our own website and blog and in many different places including social media and other web sites such as the fantastic Dee Estuary Birding site. Across the planet waders are celebrated with varying degrees of enthusiasm but here in the UK we noticed that there were no festivals or events at all so we decided that this needed addressing. In 2014 we carried out a successful World Watch event where 118 species were seen from all nine of the world’s flyways so this year we decided to enlarge this idea and make November a month of events in celebration of these birds in the UK and christened the idea Wader Conservation November. We also reached out to the Dee Estuary Voluntary Wardens to see if they would be interested in helping us set up the first UK wader festival in Wirral. The response was immediate and enthusiastic, and Thurstaston Country Park Rangers, members of the Wirral Council, Cheshire Wildlife Trust and the RSPB were also soon involved and a plan was set in place; the Wirral Wader Festival was born the first of its kind in the UK, this will be held on November 14th and 15th. The main event will take place at Thurstaston Country Park with satellite events at New Brighton, Hoylake, West Kirby / Red Rocks. Further details will be announced soon but Wader Quest will be at Thurstaston Country Park for the weekend and so we hope many of you will drop by and say hello, buy some of our merchandising, maybe even join us or just have a chat about our favourite subject; waders! Rick Simpson (Chair of Wader Quest Board of Trustees). 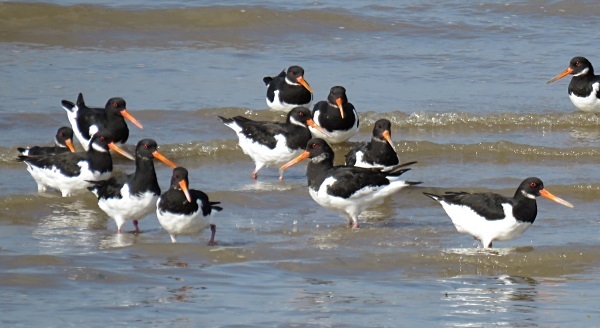 Oystercatchers at Hoylake, September 30th 2015 © Richard Smith. 2. If you want to know more about the Dee Estuary Voluntary Wardens various articles have been published on www.deeestuary.co.uk over the years, including: Dee Estuary Voluntary Wardens and the West Kirby High Tide Roost. 3. 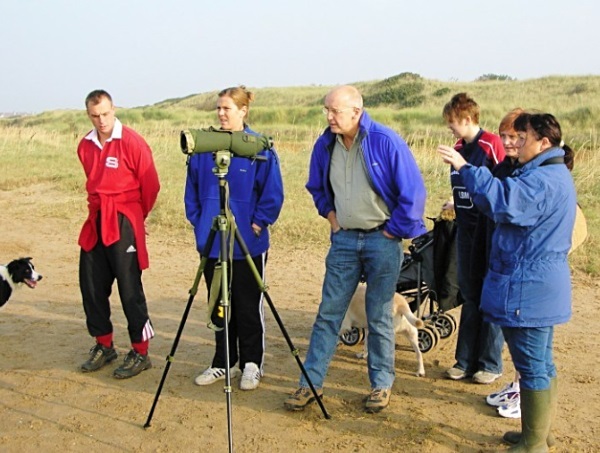 If you are thinking of joining the Dee Estuary Voluntary Wardens or want to know more about them: ring Thurstaston Visitor Centre on (0151) 648 4371, or email: wcp@wirral.gov.uk. 4. WIRRAL WADER FESTIVAL November 14th and 15th. Full details of all events will be in the November Newsletter on www.deeestuary.co.uk which will be published on November 1st. Also see below. Top left and clock-wise. Herring Gull KKY, Great Black-backed Gull J1353, Black-headed Gull TPOT, Black-tailed Godwit GG-YYflag, Black-tailed Godwit GR-WX, Black-tailed Godwit OflagL-NL. Black-headed Gull TPOT by Matt Thomas, all other photos by Richard Smith. Wader numbers were low at Hoylake so we weren't able to spot any ringed Dunlin or Sanderling during September, unlike last year. However, there were plenty of gulls there and elsewhere and since July we've logged four colour-ringed Great Black-backed Gulls, two Herring Gulls, one Common Gull and five Black-headed Gulls; below we detail the life histories of of the three photographed plus four others. 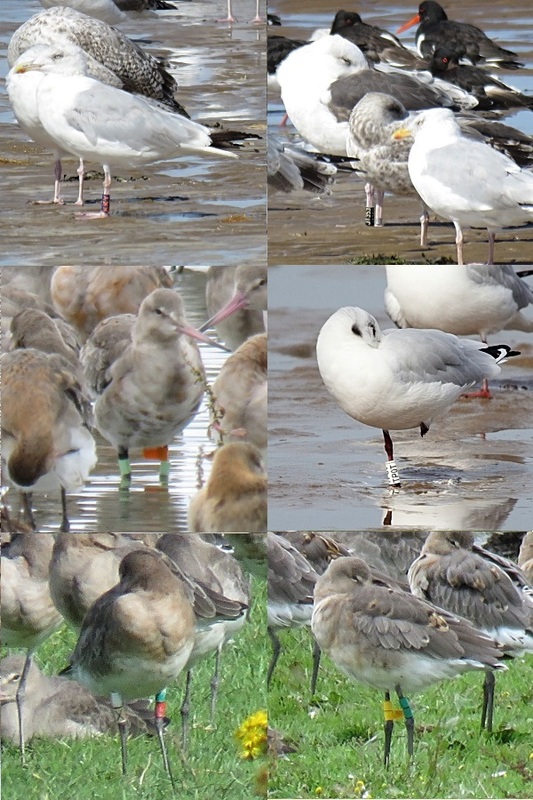 As mentioned elsewhere in this newsletter Internationally Important numbers of Black-tailed Godwits continued to visit the small flooded field next to Gilroy Nature Park in West Kirby and we managed to record 18 different colour-ringed birds in September, below are details of the three photographed. KKY orange letters on blue ring. Ringed as a three year old bird at Gloucester Landfill site on Nov 20th, 2010. Recorded on Hoylake shore on Sep 1st 2015. First recorded at Cardiff in July 2012 then at Hoylake shore in Nov 2014 and Jan 2015. T:551 black letter/numbers on yellow ring. Ringed as an adult male at Medicine Well, Montrose, on May 24th 2012. Recorded on 'the Dips'. New Brighton, on Aug 18th 2015. First recorded at Moore Nature Reserve (next to the Mersey estuary) on Jan 2013 followed by a sighting on Crosby Beach in Nov 2013. It was in a large gull roost on Richmond Bank, Mersey estuary, in Feb 2014. J39E white letters/numbers on green ring. Ringed in Oslo on Apr 14th 2015. Recorded on Hoylake shore on Aug 3rd and Sep 28th 2015. It was recorded at, or near, the ringing site in Oslo seven times in Apr and May 2015. TPOT black letters on white ring. Ringed in Cedynia on the River Odra, Poland, on Jun 14th 2015. Recorded at Hoylake shore on Sep 28th 2015. 5HP black letters/numbers on white ring. Ringed in Copenhagen, Denmark, on Mar 29th 2015. Recorded at New Brighton Marine Lake on Jul 23rd 2015. E2VA black letters on white ring. Ringed at Veluwemeer, Netherlands, on Jun 12th 2012. Recorded at Heswall Shore on Jul 26th 2015. Recorded a total of 16 times at the ringing site since the ringing date. J1353 white letters/numbers on black ring. Ringed as a chick at Tromso, Norway, on Jul 31st 2009. Recorded at Hoylake shore on Sep 1st 2015. No other records. GG-YYflag ringed as a chick in southern Iceland on Jun 23rd 2013. Recorded at Gilroy on Aug 28th 2015 then almost daily up to the end of Sep, plus twice at Thurstaston shore. First record after ringing was at Gilroy on Aug 11th 2014 and it stayed there until Oct 24th 2014. Since being ringed it has never been recorded away from Gilroy or Thurstaston. GR-WX ringed as an adult in northern Iceland on Jul 11th 2009. Recorded at Gilroy Nature Park, on Sep 1st and 2nd 2015. 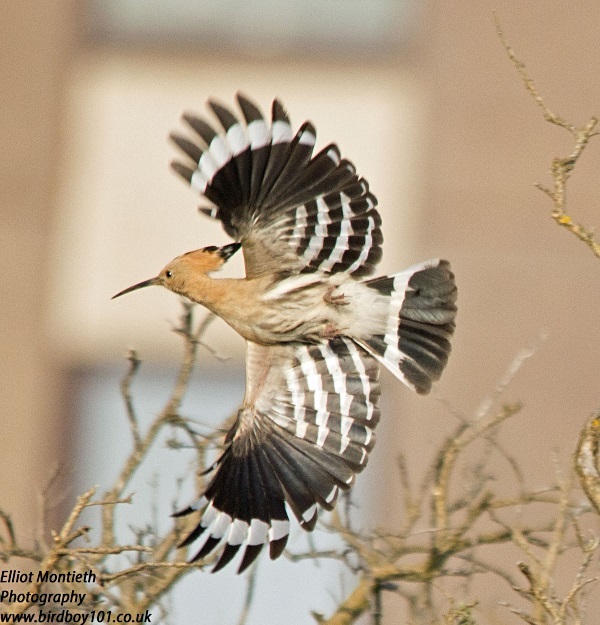 This bird winters in Portugal, last recorded there in Feb 2014, and returns north via the Netherlands having been recorded there in March 2010, 2012 and 2013. Most years, after breeding, it passes through the Dee estuary having been seen at Talacre, Inner Marsh Farm, Caldy Shore and Thurstaston Shore as well as Gilroy. It's also been recorded on the Ouse Washes, Northumberland, Rutland Water and the Upper Forth in NE Scotland. OflagL-NL ringed as an adult near La Rochelle, France, on Oct 29th 2008. Recorded at Thurstaston shore on Sep 8th and 9th 2015 and at Gilroy on Sep 11th and 12th 2015. There were three records near the ringing site in 2008, 2010 and 2014 and it wasn't recorded anywhere else until it turned up in the Netherlands in Apr 2015 when there were six records. Richard Smith and Matt Thomas. Colour-ringed birds were also recorded by Colin Schofield and Steve Hinde. Planning for the Wirral Wader Festival continues with a few timings and details still to be finalised. The complete list of events will be detailed in the November Newsletter on this website (www.deeestuary.co.uk) which will be published on Nov 1st. High tide bird watches will be held at Hoylake, New Brighton and West Kirby. There will be a low tide bird watch at Thurstaston led by Alan Davies and Ruth Miller of The Biggest Twitch. Cheshire Wildlife Trust will lead a Wildlife Walk at Red Rocks. There will be a Dusk Birdwatch at Parkgate where we should see Hen Harriers and Short-eared Owls. At Thurstaston Visitor Centre there will be a talk by Alan Davies and Ruth Miller of The Biggest Twitch plus a second-hand wildlife book sale, optics for sale and a Wader exhibit from the Liverpool Museum and British Natural History Museum (London). Various other talks and stalls are planned for Thurstaston. Note that the large majority of adults are now in non-breeding plumage, the three closest birds are juveniles which are also starting to moult into winter plumage. For those wanting to see the original Godwits at Gilroy article published in September 2015 - Please click here. 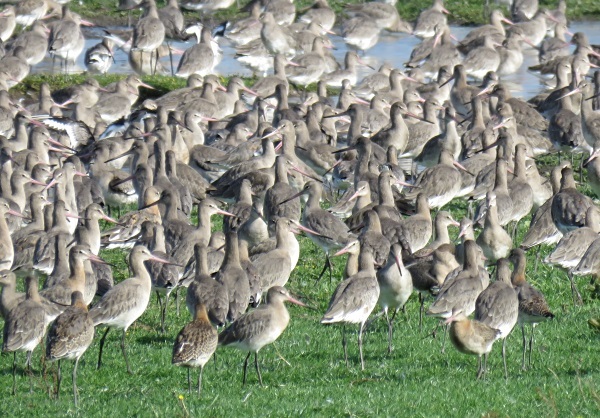 Numbers of Black-tailed Godwits remained high at the Godwit Gilroy field all September and since the end of July they have been above the Internationally Important Number threshold (610) nearly every day up to the end of September (when this article was written). It was interesting just how much interest the birds generated with a constant trickle of visiting birders coming to have a look at the spectacular sight and I had a constant stream of questions from the general public who use the path, wanting to know about the birds and why they were there. The graph above is a good comparison between the record breaking year of 2014 and this year. Numbers this year were much lower in spring, and after a late breeding season, due to bad weather in May, the birds were slower to return but during most of August and September the counts were nearly identical to 2014. There are as yet no further details of the planned Hoylake Golf Resort so we don't know how much of a threat it will be to the Gilroy field. I have yet to meet or speak to anybody who is actually in favour of this development! 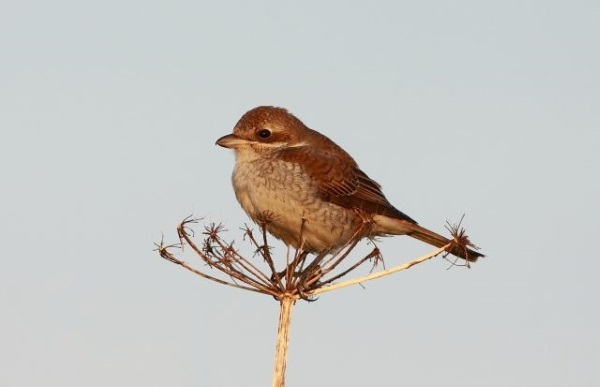 Red-backed Shrike at Meols, September 5th © Andrew Ingham. I've often talked about 'classic Septembers' in this Newsletter - well, this one was definitely not one! The weather was more like mid-summer and there were no gales, yet on the marshes, with plenty of Short-eared Owls and Hen Harriers around, it was more like mid-winter. The month started well with a couple of nice rarities showing well as you can tell from the photos, a Red-backed Shrike along Park Lane, Meols, on the 4th and 5th and a Hoopoe by the railway between Wallasey and New Brighton on the 8th. At the end of the month there was a Pectoral Sandpiper at Burton Mere Wetlands. Although still very much a scarce bird, the Great White Egret is no longer regarded as a County Rarity on the Dee estuary but five on Parkgate Marsh on the 6th was unprecedented and was part of an influx into the north-west. Four were present the following day and there were several records of three together for the rest of the month. There were also three Spoonbills seen flying past Burton Mere Wetlands and a few reports of single birds - but always distant. There were a total of 34 records (sum of daily totals) of Short-eared Owls during the month, with max of five on the 20th, these were mostly flying over Neston and Burton Marshes. This is a remarkable total, in 2013 and 2014 there wasn't single bird seen in September and the total for all of the previous three years (2010 to 2012) comes to just seven. It would be nice if they stayed for the winter. Short-eared Owl by Burton Point,September 13th © Carole Killikelly. 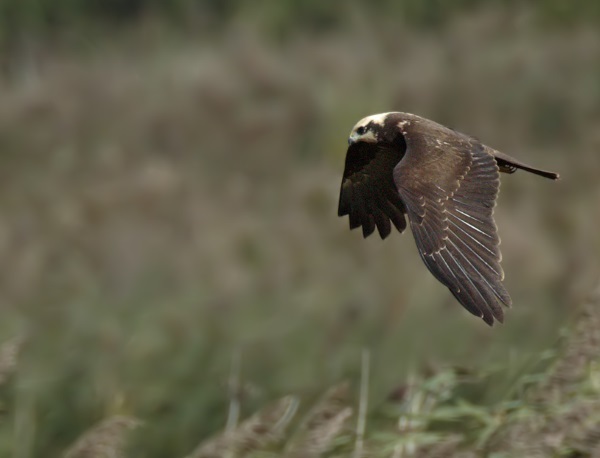 Marsh Harriers were reported throughout the month max three on the 1st and 20th, both juveniles and females were seen. A single ringtail Hen Harrier was reported on several dates with two on the 15th. There was just one Osprey (19th) but they are always rarer in autumn than spring. One or two Hobbies were recorded most days up until the 21st. Marsh Harrier at Burton Mere Wetlands, September 22nd © Steve Round. The Greenshank passage was steady if unspectacular with max counts of 15 at Parkgate on 20th and 17 at Connah's Quay on 25th. The same could be said of Ruff and there was a max count of 11 in a flooded field in Meols and 12 at Burton Mere Wetlands. Both Pink-footed and Brent Geese had arrived in small numbers by the end of the month, a definite sign of the coming winter. Many thanks go to Jane Turner, Mark Gibson, Andrew Ingham, Michael Davenport, Paul Mason, Roy Lowry, Mal Seargant, Gail Wilson, Derek Bates, Jeff Cohen, Ashley Cohen, Mark Turner, Matt Thomas, Chris Butterworth, Allan Conlin, David Haigh, Jeremy Bradshaw, Alan Hitchmough, Steve Williams, Mark Evans, Charles Farnell, Steve Round, Elliot Montieth, Dan Trotman, Ray Eades, Steve Hinde, Richard Speechley, Ian Fleming, Denzil Nicklin, Rob Morsley, Carole Killilikelly,Frank Burns, Gail Gannon, Alan Irving, George Knight, Tanny Robinson, Roy Wilson, Bill Wonderley, Jim Darwent, Tony Edwards, Paul Ralston, Paul Robinson, Steven Edwards, Paul Shenton, Mike Buckley, Tim Pugh, Julie Rogers, David Leeming, Dermot Smith, Paul Brady, Tony Breen, Paul Vautrinot, Tony Quinn, Shaun Hickey, Rob Creek, Deborah Marwala, Henry Cook, Glenn Morriss, David Poole, the Lighthouse and Wirral Birding Blog, the Dee Estuary Wardens and the Hilbre Bird Observatory for their sightings during September. All sightings are gratefully received. A calm September can often mean a stormy October and it would certainly be unusual not to get one or two gales so we can expect a few Leach's Petrels plus other sea birds such as Sabine's Gulls and various skuas, and Grey Phalaropes are often recorded this month. As well as gales October is known for it's Visible Migration, given the right conditions this can be quite spectacular with Redwings and Fieldfares arriving and large movements of Starlings and Chaffinches along with many other finches. Our over-wintering waders should start to build up and we should see good numbers of Dunlin, Knot and Sanderling. There can be good numbers of birds on the sea and calm weather should reveal hundreds of Common Scoters and Great Crested Grebes, as well as tens of Red-throated Divers. Geese numbers should increase rapidly through the month and there will be small parties of Pink-footed Geese overhead on their way from south Lancashire to the marsh off Parkgate. The Brent Geese around Hilbre could reach double-figures by the end of the month. We often get some good rarities in October, may be a rare wader or a passerine moving through with the large finch flocks, keep your eyes peeled! 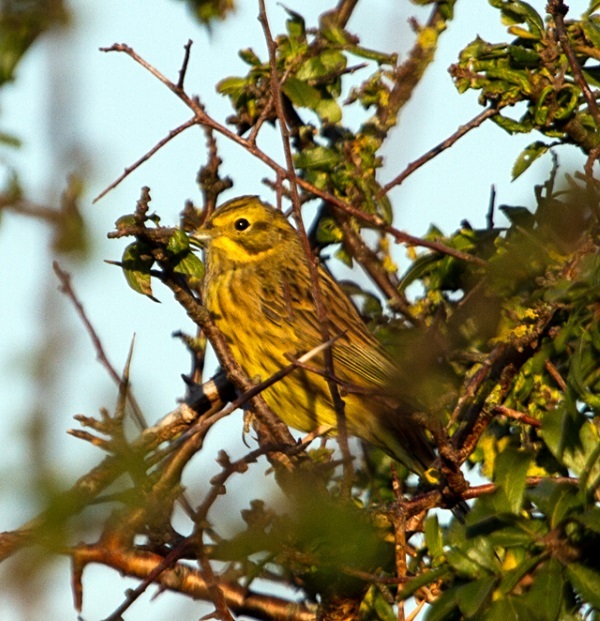 Yellowhammer in Heswall Fields, September 27th © Frank Burns. 1st October, 14.02hrs (BST), 9.9m. 27th October, 10.00hrs (GMT), 9.9m. 28th October, 11.15hrs (GMT), 10.0m. 29th October, 11.58hrs (GMT), 10.0m. Also see 2015 Events Diary. Sunday 4th October and Sunday 1st November, Skydancers on the Dee at the Donkey Stand at Parkgate (opposite Nicholl's Ice Cream Shop). Most people have never seen a hen harrier, but once seen it is rarely forgotten. In support of the RSPB's Skydancer project, we are pleased to bring you a series of events to showcase these enigmatic birds of prey which use the marshes of the Dee Estuary as their home for the winter months. The name "Skydancer" comes from the aerobatic displays that the male birds perform in their courtship ritual on the moors in the spring. Sadly, this has become an increasingly rare sight and they are close to becoming extinct as a breeding bird in England. This could be the last chance to see Skydancers on the Dee, so come along to Parkgate to find out more about the hen harrier story and what you can do to help save them before it's too late. Look for the RSPB marquee along the main promenade at Parkgate, where friendly staff and volunteers will be on hand with telescopes and binoculars to show you these beautiful, agile birds hunting over the marsh, and coming in to roost there at dusk. Plenty of family activities and other RSPB information will be available. Car parking is limited on Parkgate promenade, but there is free public parking at the Old Baths car park (CH64 6RN) at the north end of The Parade, and the Wirral Country Park car park on Station Road (CH64 6QJ). There are public toilets at Mostyn Square in the middle of The Parade, and a number of pubs and cafes for refreshments. Wrap up warm, and prepare to be patient as the harriers have a large area of marsh to roam! October 17th, Weekend Walkabout at RSPB Burton Mere Wetlands. Great for first time visitors or those who'd like a guide to help them get the most enjoyment from a visit. With constant changes as we move through the seasons, it's impossible to predict what might be seen but large numbers of herons and egrets, ducks and geese returning for the winter are guaranteed at this time of year. With a variety of birds of prey and some late butterflies and dragonflies if the sun is shining, there's always something to marvel. No booking required, just turn up on the day. A reasonable level of fitness and sturdy footwear are required. Wedenesday 28th October and Thursday 29th October, Parkgate High Tide Bird Watch. The marsh at Parkgate is one of the best wetland habitats in the northwest, and when it is flooded by an incoming Spring high tide, the wildlife which lives here is pushed closer, potentially delivering an awe-inspiring spectacle. Join us at Parkgate's Old Baths car park and the Donkey Stand near Nicholl's ice cream shop, where we'll be set up with marquees and telescopes hoping for the right weather conditions to really push the tide in. 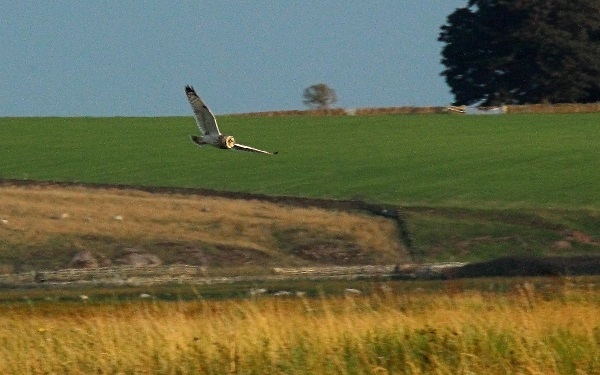 You can expect great views of the large numbers of wintering wildfowl and wading birds shifting around to avoid the rising water, whilst the small mammals living on the marsh are flushed from cover, offering a feeding frenzy for the resident kestrels and hopefully harriers and short-eared owls returning for the winter. Car parking is limited on Parkgate promenade, but there is free public parking at the Old Baths car park (CH64 6RN) at the north end of The Parade, and the Wirral Country Park car park on Station Road (CH64 6QJ). There are public toilets at Mostyn Square in the middle of The Parade, and a number of pubs and cafes for refreshments. Additional parking has also kindly been offered at Marsh Nurseries, Boathouse Lane (postcode CH64 6RD). Please note: the height of the tide can be hugely affected by the weather conditions on the day. In the event of high pressure and calm conditions, the tide will cover much less of the marsh and not reach the sea wall, whilst low pressure and strong Westerly winds will help push the tide in and offer the greatest spectacle. We recommend you check the weather forecast on the day to know exactly what to expect. Wader Conservation World Watch at Burton Mere Wetlands. Ever taken part in the RSPB's Big Garden Birdwatch? Well, our friends at Wader Quest have created an annual, global event that is effectively the same, but for wading birds rather than garden birds; the Wader Conservation World Watch. 1. Go out and see wading birds wherever you are in the world. 2. Report what you have seen and where to Wader Quest. It is that easy; no registering required, just good old-fashioned bird-watching! Burton Mere Wetlands is playing "host" to this event on the Wirral Peninsula; drop in any time during opening hours over the weekend to report your sightings from any local location, and we'll submit them to Wader Quest, credited to you of course! We'll also be reporting all waders present at the reserve over the weekend, so feel free to come down and help us seek out that elusive greenshank or little stint, or who knows what other late migrant? !